Contributions to cancer research can take many forms and fall under various disciplines. Using analytical chemistry is important for better understanding the organization and composition of molecules in tissues impacted by cancer. Colleen Riordan, a junior majoring in biochemistry, uses her chemistry and biology background to contribute to cancer research. Currently, she works in Dr. Zachary Schultz’s lab, an Assistant Professor of Chemistry and Biochemistry. The Schulz lab focuses on developing instruments and methods to analyze molecules using laser spectroscopy. 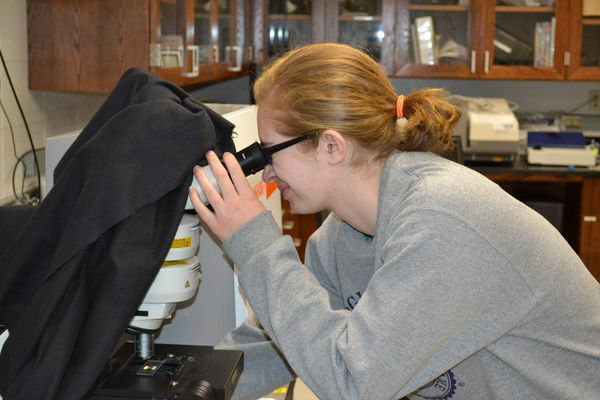 Colleen has been able to contribute to the lab’s research by focusing on her own project. She uses different forms of Surface Enhanced Raman Spectroscopy to detect and differentiate low concentrations of simple carbohydrates. She also uses Raman Spectroscopy, a method that measures scattering of laser light, which creates specific signals for each molecule. Colleen uses many approaches that were developed within the Schultz lab and she is demonstrating their use in the context of her project. One method, the flow cell, uses fast flowing water to force slower analytes (for her, carbohydrates) closer to the substrate. This method enhances the signal of the molecule. Her ultimate goal is to detect simple sugars in flow— something that has not been done before. Better understanding these chemical components will improve understanding of molecules related to cancer. If Colleen can be successful when differentiating carbohydrates, there is hope for better understanding complex molecules. Once her project can be replicated using these complex molecules, the processes underlying cancer will be better understood. Originally published by Samaria O’Brien at harpercancer.nd.edu on May 15, 2015.